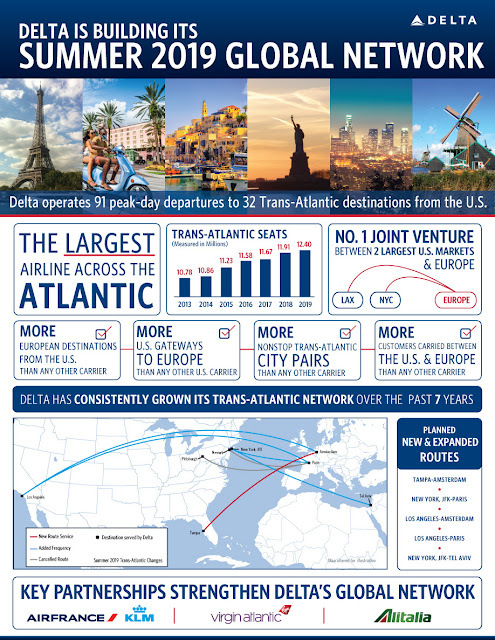 The US carrier Delta Air Lines confirmed it will be expanding its trans-Atlantic network for summer next year with some new routes plus additional frequencies on others. 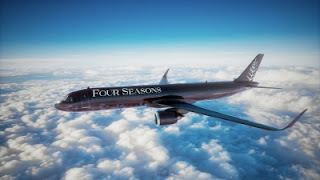 In a welcome move for Floridian inhabitants, the Trump supporting airline is going to launch the first nonstop direct flight from Tampa Bay to Amsterdam, in the Netherlands. This year-round service is scheduled to start on 23rd May. The flight will leave Tampa at 2225 to land in Amsterdam at 1245 the next day. The return leaves Schipol at 1445 landing back in Tampa at 1913. This new route will be Delta's 11th route to Amsterdam and second from Florida, the first launched earlier this year from Orlando. Meanwhile, Delta is also expanding its hub-to-hub flying between the United States and Europe with services from Los Angeles International Airport to both Amsterdam and Paris Charles de Gaulle increasing to daily operations beginning 16th June 2019. The Los Angeles to Paris service will be the third route to the French capital to be operated using the upgraded Boeing 777 aircraft which feature the Delta One suites and Delta Premium Select. The two new cabins will feature on select flights from Atlanta and Minneapolis effective 13th December. Paris is also the second European hub where customers can enjoy Delta’s new products, after their debut on the airline’s flagship A350-900 aircraft on the Detroit to Amsterdam route. All flights between the U.S. and mainland Europe are operated in conjunction with joint venture partners Air France, KLM and Alitalia. Capacity from New York-JFK will also grow next summer with the launch of a second daily nonstop flight to both Paris and Tel Aviv, Israel. For Paris, the additional flight brings the total number in conjunction with Air France, KLM and Alitalia to seven a day. The Tel Aviv service, meanwhile, has been timed as a daytime departure from Tel Aviv, completing the existing night-time departure to offer customers more choice. Both flights will be operated using A330-300 aircraft on the route, with flat-bed seats in the Delta One business class cabin. Delta has also recently upgraded its Main Cabin meal service to provide a restaurant-style dining experience in the sky complete with menu card and full drinks. Los Angeles at 6:25 p.m.
New York-JFK at 10:15 p.m.
New York-JFK at 2:32 p.m.
New York-JFK at 3:35 p.m.
Tel Aviv at 11:35 a.m.
New York-JFK at 4:50 p.m.